DVD - Pre Order Now! Movie LLC used with permission. All other graphics and site design created by MaryD. It's been a long process in the making of Ghost Town "The Movie", and we are faced with a great success with Lionsgate and Barnholtz being our distributors. We and they are equally excited about the release of Ghost Town. I especially want to thank the entire Xena fans for their impressive support of the movie and of Ren�e O'Connor. I have never seen a more loyal assembly of loving and caring fans. I am so very happy we had Ren�e in our movie and I'm sure you will be extremely pleased with the movie. Especially when you see that her role was more than a cameo appearance. In fact her character "Little Jack", is very memorable like many of the others. She did ((so very well)) in portraying "Little Jack". Ren�e came out like the others to be a part of a wonderful film (partially) about my ancestors history and a film that is a tribute to my father who also was a very good actor in the 1960's as "Digger the Undertaker". You can see pics of him on the Ghost Town movie IMDB web site. This tribute meant very much to me and Ren�e helped bring it to life. I will be ever grateful to her for that. I also want to say that in my experience working with actors and actresses, be it limited somewhat, I left the set of Ghost Town a (FAN) of Ren�e O'Connor and muchly respect her as a person. She is every bit respectful, charming, and wonderful to work with. I hope muchly that in the future I get to work with her again. She has a heart made of ((pure gold)). In closing I must add that I had additional help from MaryD, and the Talking Xena Message Forum moderators. It is greatly appreciated and you all taught me very well how caring you all are for Ren�e. My thanks to you all in so many ways. May this movie go down in history as one of Ren�e's best roles. western feature "Dean Teaster's Ghost Town" on DVD October 28th in the United States and Canada. and Coward scared audiences with their mountain man delivery that struck fear in millions of moviegoers. Princess Lucaj ("Jericho," "Uncross the Stars"), Rance Howard ("A Beautiful Mind," "Chinatown"), Renee O'Connor ("Xena: Warrior Princess," "Diamonds and Guns"), country music stars Sammy Kershaw ("The Beverly Hillbillies," "Fall Time") and Stella Parton ("A Dance for Bethany," "Rhinestone"), Terence Knox ("Tour of Duty," "St. Elsewhere") and Tony Becker ("The Walton's," "Melrose Place," "Walker, Texas Ranger"). In addition, Robert Bradley, Ghost Town in the Sky's original "Apache Kid," is also featured in the movie. Ghost Town has been accepted to screen at the 5th Annual Asheville Film Festival being held on 8 November - 11 November, 2007 in Asheville, North Carolina. The festival schedule will be available soon at the festival site. There will also be a Q&A on the film from the production staff. Renee won't be at this event. If you are North Carolina and want to see a great movie - go! Renee is so cute as Little Jack. The whole movie is superb.. I had the pleasure of watching the Behind The Scenes featurette that will be added to the Ghost Town Movie DVD and I have to say it was funny. These guys had lots of fun on that set. Dean has allowed me to show a snippet of the footage with one proviso - don't spoil anything <g> So with that in mind, here is the first clip from the Behind The Scenes footage which features Renee, Dean Teaster and DJ Perry - with a lovely black box in two places which censors <blank> from the movie. I'm not being a tease...I'm just following orders <vbg> Kudos also go to Paul Proios for editing and producing "the behind the scenes" featurette. Dean has a new Ghost Town Site! Dean has created a wonderful site dedicated to Ghost Town - check it out, it has a history about the theme park, lots and lots of pictures, a blog and a whole lot of other goodies! This is the stone I had commissioned early during filming. It pays honor the actors who visited Ghost Town in the early 60's who acted with my father. It also pays honor to the gunfighters who were in the "Internationally Famous Ghost Town Gunfighters" of the 1960's with my father. This stone to honor Dad put there by my sister Marcia, brother Bobby, and myself. 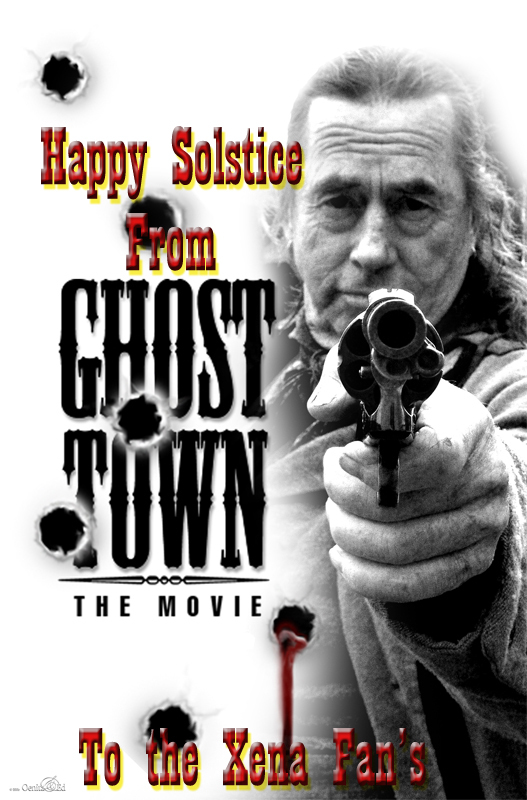 I was fortunate the other day to receive a DVD copy of Ghost Town The Movie to review by Dean Teaster. Ghost Town stars Renee O'Connor as Little Jack and a great cast. What is this movie about? Appalachian folklore and legend tell the story of a man in 1856, who came out of the mountain wilderness of Cold Springs, North Carolina to avenge his father's death. In his wake he left a Ghost Town. Today, twenty years later he returns to avenge his daughter's honor. The book also contains some pics from the movie and one of them is of Renee. 'In Deadwood, you may lose your life. In Ghost Town, it may be your soul. ...' A novel based on the movie 'Dean Teaster's Ghost Town, the Movie' (screenplay by DJ Perry, story by DJ Perry and Dean Teaster). Appalachian folklore and legend tell the story of a man in 1856, who came out of the mountain wilderness of Cold Springs, North Carolina to avenge his father s death. In his wake he left a Ghost Town. Today, twenty years later he returns to avenge his daughter s honor and even the undertaker better watch out! This novel is based on that story and the movie it inspired, Dean Teaster s Ghost Town, the Movie which was filmed at the Western theme park, Ghost Town in the Sky (Maggie Valley, NC) in November, 2006. There is also a beautiful full color section on the making of the movie. Renee has a new message up on her site and two new pictures for sale from Ghost Town! Gorgeous. Ghost Town Movie In Times Square! The movie and the official poster was featured in Times Square! Renee was gracious enough to give AUSXIP reporter Christa and her sidekick Ruth a video interview for the site. It's a wide ranging interview covering a great many topics including working on Boogeyman, Ghost Town, her thoughts on her co-workers over the years in various movies and some stories. Her thoughts about living in New Zealand, what Xena taught her and other topics. You can now order online the Smoky Mountain magazine that features an article about the movie. Not sure if it has any references to Renee in the movie. 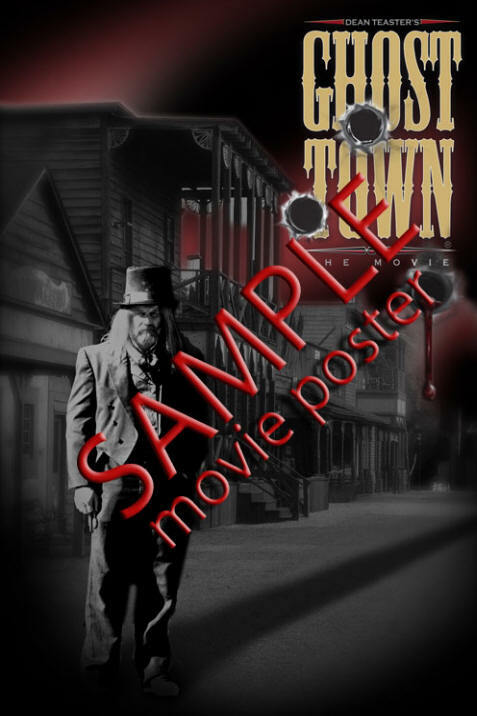 The following is one of the posters that will be sold on the Official Ghost Town Movie Site. It was sent by Dean Teaster. It should be up shortly. The poster should be up shortly. Ghost Town VIP Ticket for the premiere of Ghost Town The Movie - there are two tickets on the auction so here's your chance to attend this event! Generously donated by Dean Teaster to raise money for The Alissa Ann Ruch Burn Foundation. These tickets have not gone on sale to the public yet (24 April 2007). The ticket includes the World Premiere AND the After Glow Party afterwards. See Renee's new movie, attend the VIP party AND support The Alissa Ann Run Burn Foundation. "The World Premiere" will be followed by an elegant "After Glow Celebration." This red carpet affair is an event you won't want to miss. Mingle with the celebrities and other distinguished guests under the stars as you enjoy hors devours and other refreshments. PLEASE NOTE: Renee will not be attending the premiere or the VIP party. THe word of the premiere is spreading quickly and people are already buying up the VIP tickets. I wanted to explain the chain of events so everyone understands our step by step process. first, the premiere at Eagle Nest was limited to weekend availability and had to be done in conjuction with the Ghost Town in the Sky theme park opening around May 25th. Yes, it did bump into the Xena convention, but this will not hurt the film or the convention in any way. It is more exposure for Ren�e anyway you look at it. This would also create excitement in the Maggie Valley area during the highest tourist season. What does all of this mean, (maximum) exposure of the film to the thousand of tourists traveling to Maggie Valley through October. It has been estimated that Ghost Town may see around 3000 to 5000 people a day. Those people will be exposed to the movie as well. Ren�e and the other cast members will get ((maximum exposure to thousands)) as they migrate through the valley. Since Eagle Nest is the only place that can show a movie, it will give the tourist something to do at night in the small town valley. This premiere followed by an exclusive "Limited theatrical Engagement", will accent the distribution deal as we can show the distributor how it can pack the house for a theatrical showing. Something necessary in the overall deal for world wide distribution and release. Every second that Ren�e and the cast can be seen on the big screen is a great positive step for this film. I have to say, her character is great. She did such a ((wonderful job)), but that won't suprise anyone. That is what everyone has come to expect and get everytime we see her on film. Even if its just for one second. But that is not the case in Ghost Town, we see her ((quite well)) !!! While the Limited is running, we will then move into the final distribution deal, that is where the decision will be made for the right distributor and if it will go theatrical first, or go first to world wide "sell through" market to every market worldwide. We will then plan other premieres. Anyway it goes, its exciting. Anyway it goes, Ghost Town "The Movie" will be a huge success. I thank everyone for their support fo this film and the support of Ren�e O"Connor. God Speed for Ghost Town and the Cast. The world premiere of Dean Teaster�s �Ghost Town� will be hosted by Eaglenest Entertainment in Maggie Valley, followed by a limited theatrical engagement scheduled to run through October. The premiere will be 2 June 2007. Renee will not be attending since she will be in New York for a Creation Entertainment Xena Convention and Lucy's Concerts. Dean would like to pass on the news that Ghost Town will have a premiere in LA. The details of that will be posted when they are finalised. That will give everyone who wishes to go an opportunity (and may include Renee being at the premiere). The official premiere in June is the kickoff of the movie with a Limited Theatrical Engagement to run until October. The planning of the LA premiere will start in earnest after the 2 June premiere. "Today we finished the final cut of the movie. It consisted of going back through the entire movie scene by scene and trimming out anyhing that did not flow. I had the responsibility of going through and cutting out and trimming down to (seconds) that did not work, or did not add value to the film. This included looking at each cut to determine if they had the correct amount of time on each one, removing anything in the backgrounds that did not work, changing scenes for best performances. It was an exhausting effort, but well worth it. I will know tomorrow, but I believe I trimmed around 5 to 7 minutes from the film. We are looking real good." Added six more photos of Renee as Little Jack including some of the other cast and crew. Dean has sent in some more behind the scenes pictures of Renee from the set of Ghost Town as well as some of the cast and crew. Just an update on the ROC pics from Ghost Town which are now up on the auction. The pictures are not 8 x 10 but 11 x 13. I can't alter the auction description now but please know that the size has changed. The following items were donated by Dean Teaster, Director and producer of Renee's new movie Ghost Town The Movie. Added more Behind the Scenes pics of Renee courtesy of Dean Teaster and Tammy Teaster who took the photos. Dean answers questions about the movie, Renee and upcoming projects. If you would like to ask a question about the movie or Renee's involvement with the movie, you can now send an email with your question. Please have your question emailed to me at maryd@ausxip.com by the end of Sunday. More behind the scenes pics of Renee courtesy of Dean Teaster. There is also a picture which was taken in the early morning just above Ghost Town In the Sky Theme Park which is just one of the most gorgeous landscapes I've seen in a long time. Breathtakingly beautiful. This has to be one of my favourite pictures of Renee from the movie (so far). She is so cute with that cheeky grin. Dean sent me some pictures that I have posted in the Behind The Scenes galleries including a couple of Eric Jones, the 1st assitant director. My first directing debut was this film Ghost Town. It was an experience that has and will continue to change my life. My first film and I got to work with Rance Howard, Bill McKinney, Herbert "Cowboy" Coward, Charlie Matthau, Tony Becker, Princess Lucaj, Stella Parton, Sammy Kershaw, Terrence Knox, and of course "Renee O'Connor. Let's talk about that for a minute. There are no words to describe the level of professionalsim in this lady. She is truly an actress that is a pleasure to work with. She is kind, considerate, respectful, and talented beyond any imagination. I cannot convey in words what it was like to work with her and see her bring to life, "Little Jack". She came prepared and ready. I can see why she has such a huge following. She deserves all the credit due to her both professionally and personally. There was a moment in the film between takes where I noticed her crying. I immediatly wanted to see if she was alright. Much to my suprise, I asked her "Are you alright", she said yes, "I'm just getting into the moment of Little Jack". That says it all. God Bless Renee O'Connor. Added Mike McDonalds Behind The Scenes report from the set of Ghost Town. Mike was an extra for the movie. Renee O'Conner is also someone who deserves mention. The story is that I was dealing with her manager over a different actor and her name came up. I had watched XENA because of producers Sam and Robert coming to MSU, knowing Bruce Campbell from my director buddy Mike Kallio and Lucy Lawless. So Renee read the script for a small female role as most of the major roles had been cast. She really liked the script but wanted something meaty. It was moments after I told her manager that we would try to use her on a future project that I started thinking, "What character(s) did I write as a man that could be played by a woman?" When the character of LITTLE JACK crossed my mind it was a perfect fit. Renee was called and the rest is history. She is a powerful supporting actress in this film playing an outlaw with a motley gang and her fans will love her bad side in this gritty mountain story. She hangs with the roughest of them and would anyone expect anything less from Xena's former partner in crime? I luv ya Renee and she handled that rifle with the same expertise as that bo staff! The scheduled released date for the movie is May 2007, in conjunction with the reopening of the Ghost Town Theme Park according to the article in the Citizen-Times. Behind The Scenes on Ghost Town Movie Set - Mike McDonald was an extra on Ghost Town and these are his photos from the time he spent on the set of Ghost Town - Contributed by Mike Donald. No photos of Renee. Renee has a new message on her site from the set of her new movie Ghost Town. There is also a picture of her and DJ Perry, writer, producer and actor. Click here to read Renee's message and view the picture. If you are subscribed to Kit #12 you can view another pic on the Kit #12 site. - Subscription required. �Ghost Town the Movie� directors Dean Teaster and Jeff Kennedy are calling for budding actors and actresses to audition for a limited number of roles in the upcoming feature film, scheduled for release next spring. Pre-production is underway and shooting is set to begin Oct. 16 at locations in Canton and Maggie Valley. The movie, set in 1870, will depict a western theme with touches of Appalachian folklore and will chronicle the life of Haywood County native Harmon Teaster. Many of Ghost Town theme park�s famed gunfighters will be featured. 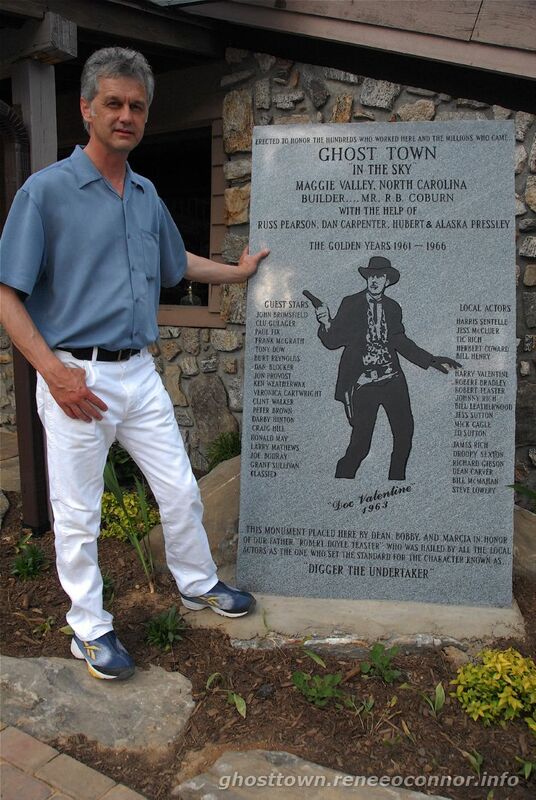 Mountaineer (Waynesville) (NC, US) 14 October 2006 Do you have the Ghost Town look? Mountaineer (Waynesville) 4 October 2006 Maggie residents fund Ghost Town movie. Mountaineer (Waynesville) (NC, US) 4 October 2006 Ghost Town movie creates a stir.